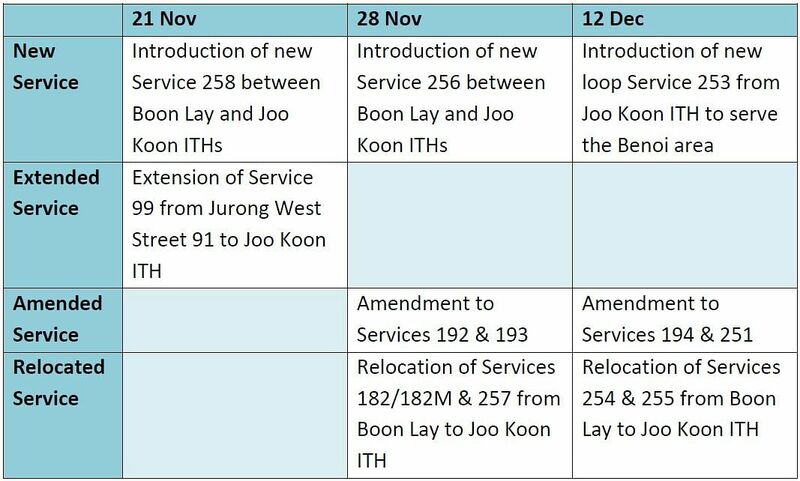 SINGAPORE - The Joo Koon Integrated Transport Hub, which features a new bus interchange, will officially begin operations on Nov 21. Bus operations will be implemented in three phases over a period of four weeks - the first will start on Nov 21, the second a week later and the last on Dec 12. Eight bus services, including new services 253, 256 and 258, will operate from the hub, which is expected to improve the transport options for commuters living and working in the Jurong and Tuas areas. Providing an air-conditioned link between the bus interchange and Joo Koon MRT station, it also houses the $350 million FairPrice Hub. Launched in September, the FairPrice Hub features a high-tech distribution centre and also serves as its headquarters for more than 600 employees. The transport hub has been fitted with barrier-free facilities such as dedicated boarding points and graduated kerb edges to make it more wheelchair-friendly. Its concourse area was also designed to feature priority queues with seats for the elderly and disabled, in line with the Land Transport Authority's efforts to create a more elderly-friendly transport system. Joo Koon is the eighth area to receive its own integrated transport hub. Two more are currently being constructed in Bukit Panjang and Yishun, and will be completed in 2017 and 2019 respectively.